BACKGROUND AND PURPOSE: High cortical signal intensity on diffusion-weighted (DW) or fluid-attenuated inversion recovery (FLAIR) images is increasingly described in sporadic Creutzfeldt-Jakob disease (sCJD). The aim of this study was to assess the extent and location of high cortical signal intensity, to investigate whether DW or FLAIR is superior in showing changes in cortical signal intensity, and to find out whether the distribution of the signal intensity changes is random or follows a common pattern. MATERIALS AND METHODS: We analyzed FLAIR and DW MR imaging scans of 39 patients with sCJD for hyperintense cortical signal intensity. We compared the sensitivity of the DW and FLAIR scans. We correlated the extent and location of the cortical signal intensity changes with concomitant changes in deep gray matter and the genotype of codon 129 of the prion protein gene. RESULTS: There was high signal intensity in the insula, the cingulate gyrus, and the superior frontal gyrus in 95%. The cortical areas near the midline also frequently showed the abnormal signal intensity (precuneus 87%, paracentral lobe 77%). The precentral and postcentral gyri were affected less frequently (41% and 28%, respectively). The DW MR imaging showed the cortical changes more effectively than FLAIR. There was no correlation between the distribution of changes and additional signal alterations in deep gray matter or the genotype of codon 129. CONCLUSION: The distribution of cortical signal intensity abnormalities in patients with sCJD follows a common pattern, affecting mainly the cortical areas near the midline, the insula, cingulum, and the superior frontal cortex. DW imaging is superior to FLAIR in the detection of cortical high signal intensity. In the present study, we analyze the extent and distribution of signal intensity changes in a group of 39 patients with sCJD with cortical signal intensity abnormalities to find out whether the high signal intensity changes are distributed randomly or whether they share a common pattern. In addition, we investigate whether the distribution of the cortical signal intensity changes correlates with the involvement of the areas of deep gray matter and whether there are differences in the distribution of signal intensity changes among molecular sCJD subtypes. We compare FLAIR and DW images to determine which sequence is more effective in showing cortical signal intensity changes. We studied MR imaging scans of 39 patients with sCJD: 20 were neuropathologically confirmed (definite sCJD),19 and 19 were classified as having probable sCJD.1 We did not include the cases of patients with possible sCJD.1 Patients were referred to the German CJD Surveillance Unit in the years 2001–2003, as described previously.3 In our study group, 19 patients were female, and 20 patients were male. The mean age at onset of disease was 64 years (± 8.7 years). The mean time from onset of disease to MR imaging was 3 months (± 2.5 months). The genotype at the polymorphic codon 129 of the prion protein gene was known in 34 of the 39 patients: 25 were homozygous for methionine (MM); 5, homozygous for valine (VV); and 4, heterozygous (MV). The pathologic prion-protein type (PrPSc) was determined in 11 patients: 8 had PrPSc type 1 and 3 had PrPSc type2. Combining codon 129 and PrPSc type gave the following molecular subtypes12: 7 patients with MM1, 2 patients with MM2, and 1 patient each with MV2 or VV1. 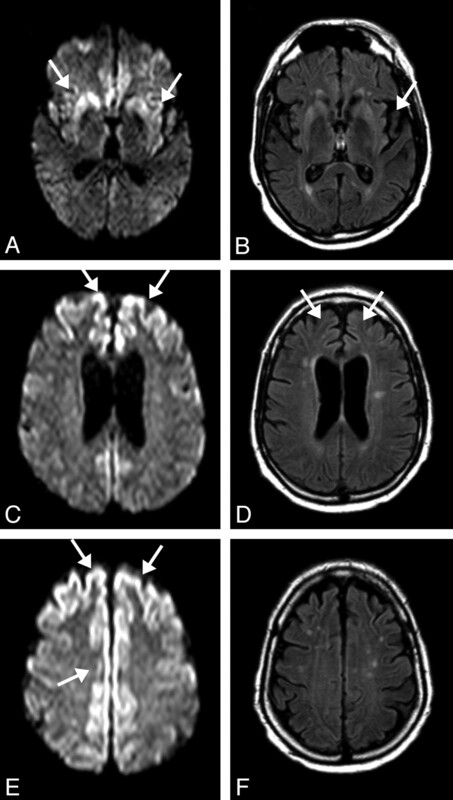 The study group was derived from a larger group of patients with CJD described previously in detail.3 As a prerequisite, only those patients with sCJD whose MR images showed signal hyperintensity in at least 1 cerebral cortical area and who had a whole-brain MR examination of adequate image quality, including FLAIR and/or diffusion-weighted scans, were included in the present study. Eighteen patients had both FLAIR and DW scans, 13 patients had FLAIR, and 8 had DW sequences only. In total, 31 FLAIR and 26 DW scans from 39 patients were available. For analysis, we used the hard-copy documentations of axial scans. Because patients were referred from institutions all over Germany, they had been examined on different scanners: 30 patients on a 1.5T scanner and 7 patients on a 1T system. In 2 patients, the field strength was not given on the hard copies. Scan parameters differed little between the institutions; in most DW images, diffusion gradient strengths (b-values) of 1000 s/mm2 were used. Two observers (H.J.T., H.U.) analyzed the MRIs in consensus. The 2 radiologists recorded the cortical regions20 with abnormal signal intensity. Abnormal cortical signal intensity was defined as a ribbonlike hyperintensity in the cortex considerably different from other cortical areas of the same patient. We took into account the normal variability of MR signal intensity in the cerebral cortex with higher signal intensity in the insula, the cingulate gyrus, and the basal and medial temporal cortices in the studied sequences.21 Thus, the slight increases in signal intensity only in the aforementioned brain areas were not accepted as abnormal. We recalled DW and FLAIR images simultaneously and noted on which sequence the signal intensity changes were easier to detect. Abnormal cortical signal intensity was recorded for a gyrus if the signal intensity changes were detectable at least on 1 hemisphere. We noted whether the signal intensity abnormalities were symmetrical or whether they were predominant on 1 side. We compared the distribution of the signal intensity changes among the different genotypes. For statistical analysis, the χ2 test corrected for multiple testing was used. Corrected P values <.05 were considered statistically significant. There was widespread involvement of the cerebral cortex, which is summarized in Fig 1. Most frequently, the insula, the cingulate, and the superior frontal gyri were affected in 37 of 39 patients (95%). 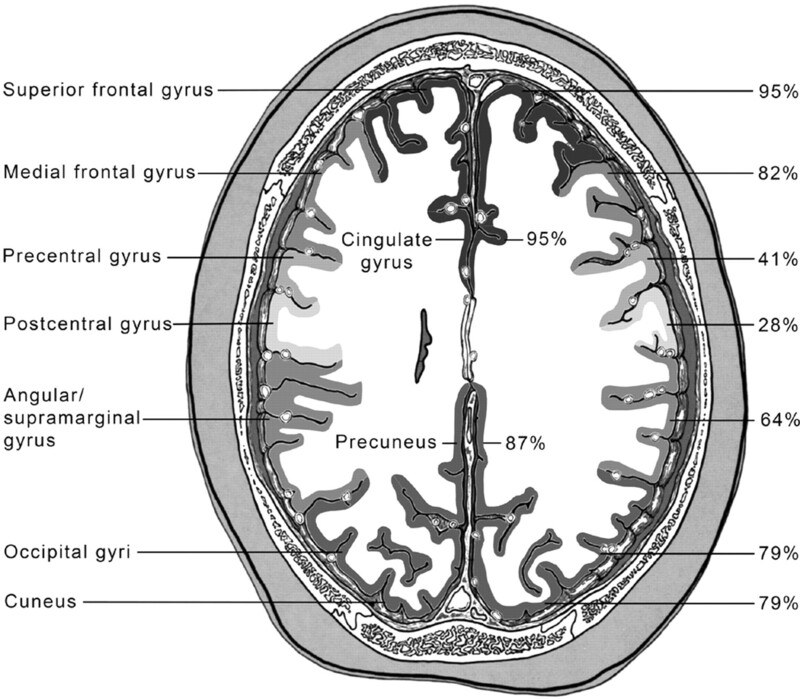 This was followed by the cortical areas near the midline, such as the precuneus in 34 of 39 patients (87%), the cuneus in 31 of 37 patients (79%), and the paracentral lobe in 30 of 39 patients (77%). More than two thirds of the patients had high signal intensity in the medial frontal gyrus (32/39) and the occipital gyrus (31/39). In most patients, the angular/supramarginal gyrus (25/39 patients), and the superior parietal (24/39) and inferior frontal gyri (21/39) were affected. Abnormal signal intensity in the primary sensory cortex (postcentral gyrus, 11/39 patients [28%]), the primary motor cortex (precentral gyrus, 16/39 patients [41%]), and the medial (15/39) and superior temporal gyri (12/39) was less common. Asymmetric lesions were present in 16 of 39 patients (41%): in 10 patients (26%), high signal intensity predominated on the left side and in 6 patients (15%), on the right. In all patients, the hyperintense lesions were not completely confined to 1 hemisphere, but there were slight changes also on the contralateral side. In summarizing the signal intensity changes for the different lobes, the frontal lobe was involved in 100% of patients, the parietal lobe, the cingulate gyrus, and the insula showed abnormal signal intensity in 95%. The occipital lobe was involved in 85% and the temporal lobe, to a lesser extent, in 49%. The criterion for selection for inclusion into this study was the presence of cortical signal intensity changes. Among the 39 patients studied, 3 patients had cortical hyperintensity only; 16 patients had cortical changes and, additionally, high signal intensity in the striatum; and the remaining 20 patients had a combination of cortical, striatal, and thalamic signal intensity abnormalities. The distribution of cortical changes did not differ significantly among these 3 groups. The χ2 test corrected for multiple testing demonstrated P > .05 in all cortical regions (On-line Table 1). Compared with FLAIR, it was easier to detect the hyperintense cortical signal intensity changes on the DW images. Sensitivity for the detection of signal intensity changes was 74% (23/31 patients) on the FLAIR images and 96% (25/26 patients) on the DW images. Both sequences were available in 18 patients: on visual assessment, the DW images were judged to be more effective than FLAIR in 14 patients. Indeed, in 8 patients, the cortical lesions were discernible only on the DW images. In 6 patients, the abnormal signal intensity was more easily detected on the DW than on the FLAIR images. In 3 patients, both the FLAIR and DW images showed the signal intensity changes equally. In 1 patient, there was low image quality of the DW images that led to a better detection of signal intensity changes on the FLAIR images. There was no statistically significant difference between the FLAIR and DW sequences in the frequency of hyperintensity in the different cortical regions (χ2 test, corrected for multiple testing: P > .05 in all cortical regions; On-line Table 2). According to the genotype at codon 129 of the prion protein gene, stratification of patients showed some differences in the distribution of the cortical signal intensity changes (eg, high signal intensity in the occipital cortex was present in 96% of patients with the MM genotype, but in only 60% of patients homozygous for valine and 50% of heterozygous patients). These differences were not significant (χ2 test corrected for multiple testing: P > .05 in all cortical regions, On-line Table 3). We were able to confirm that DW images have a higher conspicuousness for the detection of cortical changes compared with FLAIR (Figs 2 and 3).4,9–11,23 Whether the high signal intensity was detected on DW images only or on DW images and FLAIR images, there was no statistically significant difference in the distribution of signal intensity changes (On-line Table 2). We thus conclude that DW and FLAIR images show the same cortical signal intensity changes, but the use of DW imaging provides an increased probability to detect them. In our present study, we had hard-copy documentation of the DW scans (generally with b-values of 1000 s/mm2). Young et al4 reported an easier detection of signal intensity changes by using soft-copy images. Rowley et al24 described a very high sensitivity of b-value (b = 2500 s/mm2) DW MR imaging in the diagnosis of CJD. Therefore, we cannot exclude the idea that the cortical signal intensity abnormalities in CJD will be even more widespread using higher b-value DW images or a digital display system that would allow the adjustment of window and level. MR imaging scans of a 57-year-old patient with probable sporadic CJD 8 months after onset of disease. On DW MR imaging (A, C, E), there is hyperintensity in the striatum and insula (A), the superior and middle frontal gyri, and the precuneus (C), the superior and middle frontal gyri, the precuneus, and the paracentral lobe (E). On FLAIR (B, D), the insula and cingulate gyrus show increased signal intensity, whereas the hyperintense changes in the precuneus and paracentral lobe, easily identified on DW imaging (E), are questionable on FLAIR (F). 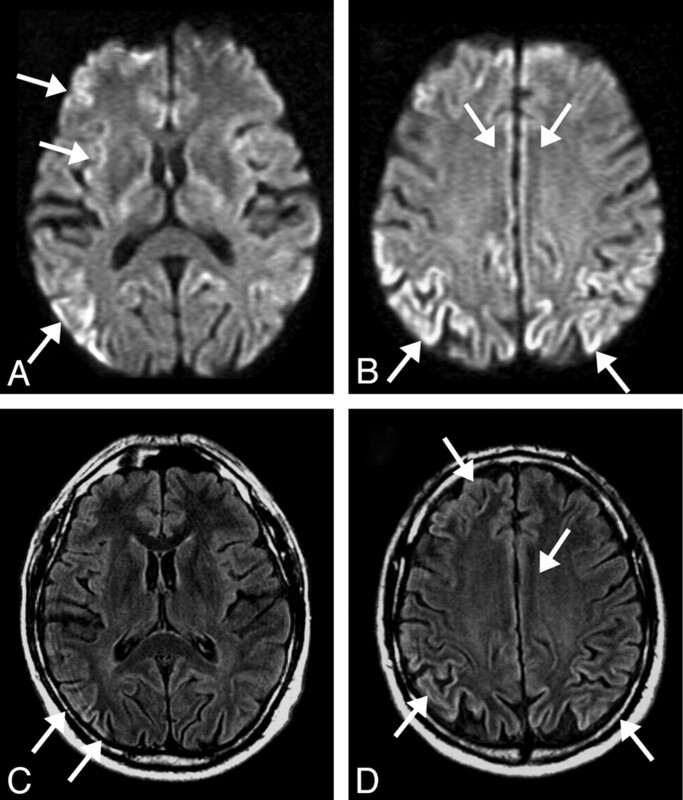 Concerning the cause of the distribution of lesions, we propose 2 hypotheses: 1) predominant manifestation of the disease in cortical areas with signal hyperintensity in MR imaging and 2) a sequence-inherent higher sensitivity in cortical areas bright on MR imaging as a result of intrinsic variations in the water content of different cortical regions in a diffuse cortical process. We are not aware of a systematic study that would compare the distribution of signal intensity changes on MR imaging and patterns of neuropathologic lesions. To our knowledge, the largest study on neuropathologic lesion patterns in sCJD (not dealing with MR imaging) was published by Parchi et al in 1999.12 They showed that the subtypes of sCJD have differences in the severity of pathologic changes in different brain areas, including the basal ganglia and cortex. In the most frequent sCJD subtype in Western countries (MM1), the severest affection was in the occipital cortex, followed by the parietal, frontal, and temporal cortices.12 The insula and the cingulate gyrus were not listed separately in their article. Patients with the MM1 subtype had predominantly pathologic changes in the cortex and fewer pathologic changes in the basal ganglia, whereas patients with the second most common subtype (VV2) were described with more severe pathologic changes in the basal ganglia/thalamus than in the cortex. They reported that the frontal cortex was more severely affected than the occipital cortex in the patients designated VV2.12 These findings suggest that some cortical areas are more severely affected than others in the same patient and that this distribution is influenced by the sCJD subtype. In our current study, we looked for differences in the MR lesion patterns among the MM, VV, and MV genotypes, but these differences did not reach statistical significance. This is probably due to the limited number of patients designated MV (n = 4) and VV (n = 5) (On-line Table 3). The normal variation of signal intensity in the cerebral cortex on FLAIR and DW imaging could also influence the detectability of the high cortical signal intensity. In healthy persons, DW imaging reveals signal hyperintensity predominantly near the skull base21,30and on FLAIR in the amygdala, hippocampus, cingulate gyrus, and subcallosal area.21 These high-signal-intensity areas were explained for FLAIR by differences in the water content of cortical brain regions21 and by variations in T2 relaxation times,30 and for DW imaging by susceptibility artifacts. There is an overlap of normal cortical high signal intensity in healthy subjects and abnormally high signal intensity in patients with sCJD in certain brain regions such as the insula or cingulate gyrus,4,31 whereas there is no significantly higher signal intensity in patients with sCJD in the hippocampus or the temporobasal and frontobasal cortices, usually bright on FLAIR or DW imaging in healthy persons.21 We propose that the high conspicuity of cortical hyperintensity in areas such as the cingulate gyrus or the insula is the result of a combination of increased signal intensity due to underlying pathologic changes and the intrinsically higher signal intensity in these brain areas on DWI or FLAIR. Cortical hyperintensity was accompanied by high signal intensity in the basal ganglia and/or thalamus in 36 of 39 patients in the current study. This is more than reported by others.2,4,11 Because of the limited number of patients with cortical lesions without involvement of deep gray matter, comparing the distribution of the signal intensity changes among the groups did not reach statistical significance. From a clinical standpoint, the most difficult differential diagnoses for sCJD are rapidly progressive Alzheimer disease,33–35 dementia with Lewy bodies,35 and multiple cerebral infarctions.36 In none of these diseases are cortical MR signal intensity changes usually present. Therefore, these diseases would not be part of such a comparison study. There is a common MR pattern of cortical involvement in sCJD, which consists of high signal intensity in the insula, the cingulate and superior frontal gyri, and in the cortical areas near the midline. In patients with dementia who have the described cortical changes, the suspicion of sCJD should be raised even without involvement of the structures of the deep gray matter. The DW imaging allows easiest identification of the signal intensity changes and should therefore be included in the work-up of patients with suspected sCJD. The specificity of the described pattern needs to be evaluated further. We thank all physicians who referred suspected patients to the German Reference Center for Spongiform Encephalopathies for providing clinical data, MRIs, and brain necropsies. We especially thank Hanno Schimikowski, Department of Radiology, University of Bonn, for his assistance with figure editing. H.U. and I.Z. contributed equally to this work. This study was supported by grants from the Bundesministerium für Gesundheit und Soziales (BMGS), grant Az 325-4471-02/15 (to H.A.K. ); the Bundesministerium für Bildung und Forschung (BMBF), grant D1GI0301 (to I.Z. ); the European Commission, grant QLG3-CT-2002-81606 (to I.Z.). Paper previously presented at: Annual Meeting of the Radiological Society of North America, December 1, 2005; Chicago, Ill.
Young GS, Lin Y, Chen N, et al. Abnormality of apparent diffusion coefficient (ADC) in somatosensory cortex in Jakob-Creutzfeldt disease (CJD): is rolandic cortex really spared? Paper presented at: Annual Meeting of the Radiological Society of North America; Nov 26–Dec 1,2005; Chicago, Ill.
Tschampa HJ, Kallenberg K, Zerr I, et al. Pattern of cortical changes in sporadic Creutzfeldt-Jakob disease. Paper presented at: Annual Meeting of the Radiological Society of North America; Nov 26–Dec 1,2005; Chicago, Ill. Accepted after revision November 30, 2006.